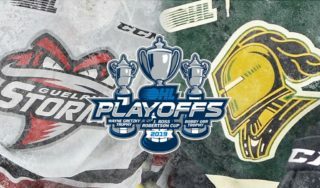 In a game that gave a great demonstration of the art of goaltending, the Windsor Spitfires blanked the London Knights 2-0 at the WFCU Centre on Thursday night. Joseph Raaymakers of the Knights and Michael DiPietro of the Spitfires took turns making toe saves and denying rebound tries. DiPietro made 32 saves and was named first star. Raaymakers took second-star honours with 26 stops on the night. The Knights pressed all game long. Liam Foudy had six shots on goal while Connor McMichael and Adam Boqvist each had five. McMichael had been off to a hot start with four goals in three games heading into Thursday. Hunter felt at times the Knights got caught trying to make a nice play instead of the easiest play. 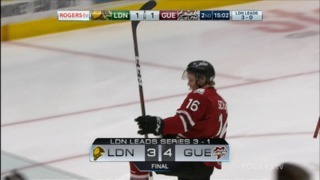 London’s power play was held quiet, but Hunter was not overly concerned. The first one happened in a flash. Sergei Popov of the Knights made a great defensive play, picking off a centering pass from behind the net, but as Popov tried to move the puck to safety, the long reach of six-foot-nine-inch Curtis Douglas stole it away and wrapped the puck past London goaltender Raaymakers. 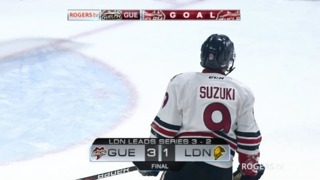 The only other goal came late in the third period as Spitfires rookie Will Cuylle shifted to the right point to cover for a pinching defenceman only to have the puck come back to him. Cuylle wristed it at the net and forward Cole Purboo deflected it in for a 2-0 Windsor lead. Liam Foudy of the London Knights and his brother Jean-Luc were born roughly two years and two months apart. Thursday marked the first of what should be quite a few meetings in the OHL. Both brothers were held off the scoresheet, but each of the brothers created offensive chances all game long using their speed. Bragging rights will be back up for grabs on Nov. 25 as London returns to Windsor. When it leaves Halifax in late May of 2019, the Memorial Cup trophy will spend some time with the latest championship team in major junior hockey and then get set for its next destination. The city of Kelowna, B.C., was selected as tournament host in 2020. Kelowna played host in 2004 with a brick wall of a defence led by Shea Weber that allowed three goals against in the four games that they played. Kamloops, B.C., and Lethbridge, Alta., also submitted bids to host. 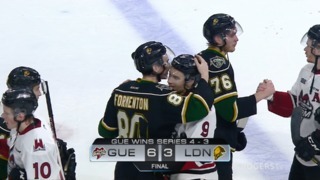 The London Knights headed right home from Windsor and will play the Owen Sound Attack on Friday. The game will be the first meeting between the teams since the end of their playoff series last spring. The Attack are 2-3 on the season and coming off a 5-2 victory over the Sarnia Sting on Wednesday. Kevin Hancock and Nick Suzuki each had three points in that game and helped Owen Sound outshoot the Sting 50-32.